The long held belief that more meals are required to keep you lean and muscular is being challenged by new research. For as long as any of us can remember, it’s been thought that the only way to build lean muscle and lose fat was to have athletes eat 5-7 small meals per day. But the truth is that there are many ways to eat in regards to meal frequency and science continues to hammer the point home. Older research suggested that consuming frequent meals would speed up the metabolism, control insulin and cortisol, and manage appetite. Now, a recent study published in the Journal of the International Society of Sports Nutrition found, among other things, that while increasing meal frequency does blunt appetite and decrease hunger, it does not appear to favorably alter body composition, improve energy expenditure or raise resting metabolic rate. Let the head scratching begin. What can we gather from the research? Mainly that as long as we eat the right foods in the right amounts, meal frequency is a matter of personal preference. It all comes down to what best fits your schedule and how your body responds best. If you like eating six times a day and that works, keep doing it. If you like to only eat a couple big meals, then do it. If you stand with the old guard and are taking down six meals per day and that is not working for you, then switch it up. It's that simple. There is no set way for anyone and, as with different types of workouts, will ultimately be a matter of experimentation. 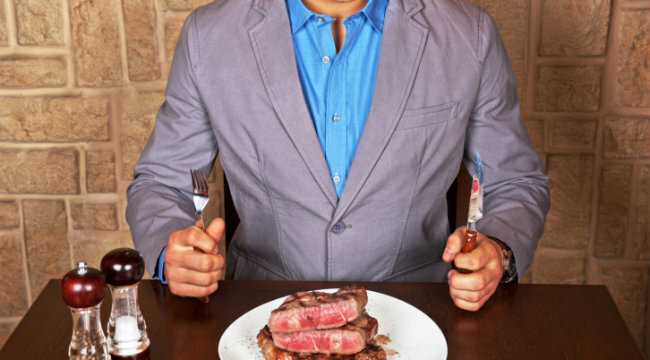 At the end of the day, if you consume the right amount of protein, carbohydrates, fats, calories, vitamins, minerals and phytonutrients, meal frequency is obsolete. Try this sample “three squares a day” approach – making small adjustments to match your goals – to see if less frequent feedings can help you. If you’re gaining strength, getting lean and not walking around hungry all day, chances are you’re on the right track.